This property has bee REDUCED for immediate sale. Beautiful turnkey island home perched on a hillside overlooking a calm water harbor where the famed two Isla Zapatillas in the National Marine Park, can be seen from the property. There are jungle trails on the 7 1/2 acre property behind the house. The house is an easily maintained hilltop home with single wall wood construction throughout the house. It has a kitchen, dining area, 1-bedroom and 1-bath.It has a nice sitting room and a large front porch with all the views.There is ample covered work space below and there is an assortment of tools included. There is internet service available. More rooms can be built under the house as there is a strong cement foundation. A new metal roof was just installed as well a new concrete stairway. The house is totally eco-green, as it has strong solar system with 6 brand new solar panels, a state of the art composting toilet,and a rain forest water collection system with a new pressure tank. A large covered boathouse with 4 berths and with a security system,is shared with the adjoining property A 23 FT PANGA BOAT WITH A 60 HP MOTOR IS INCLUDED WITH THE SALE!!! A similar style eco house is built next door and it shares another 7 1/2 acres for use of jungle trails. Neighbors are great and it works very well as there is always someone on the property and they look after each others property. A caretakers cabin is at the bottom of the hill and the longtime trusted caretaker who keeps the property clean, can stay there at various times if needed. You will hear the songs of toucans, parrots and many other tropical birds in the trees as this is a birder paradise. There is a variety of tropical fruits planted near the house which you can expand on.Also you can start a vegetable garden for those fresh veggies. 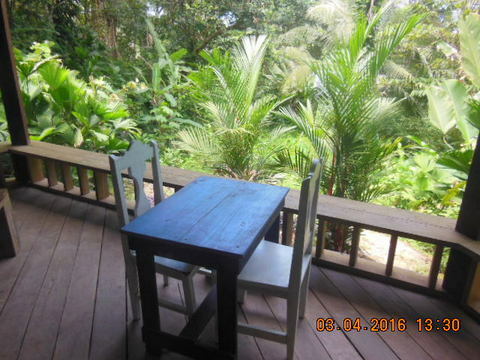 This property is designed for tranquility and tropical beauty while not being too far away from Bocas Town which is only a 30 minute boat ride away. Crawl Cay is very close by for lunch, tourist watching, gasoline, and a small local market. The property is right next to the National Marine Park where there is some of the most incredible snorkeling and diving nearby. This is one of only a handful of affordable houses with property in this price range that is total turnkey .Buy on Monday and move in on Tuesday , just bring your tooth brush. Property has long term very clean Rights of Possession ex-pat ownership. Health issues are the factor for selling. This is a great opportunity to own an affordable home in an incredible location…Hurry priced to sell!